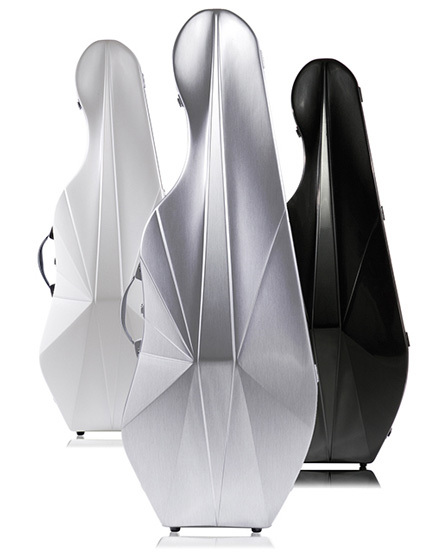 Bam is a French company that produces stylish cases of sophisticated design. One Year Warranty. High Tech series cases are made in France with final assembly in the US. Other models made in Thailand. 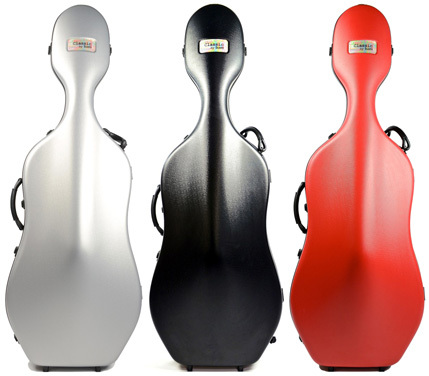 We are offering FREE Shipping on Bam Cello cases. To get this offer, add a case to your shopping cart. Then, return to this page, and click on this Icon. 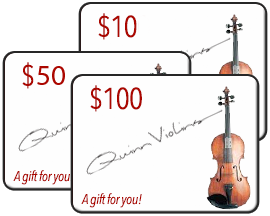 You will see a credit in your shopping cart to offset the cost of standard domestic shipping. 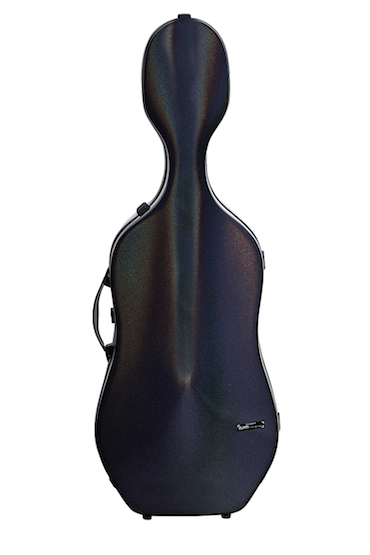 The workhorse model of the Bam High Tech series cases. 5 latches. 2 bow holders. These models are available with Wheels or Without. Voyager model is a heavier-duty version and comes with Wheels only. Without wheels 11 pounds (5 kg). With Wheels 11.7 pounds (5.3 kg). Voyager weighs 14.2 pounds (6.5 kg). 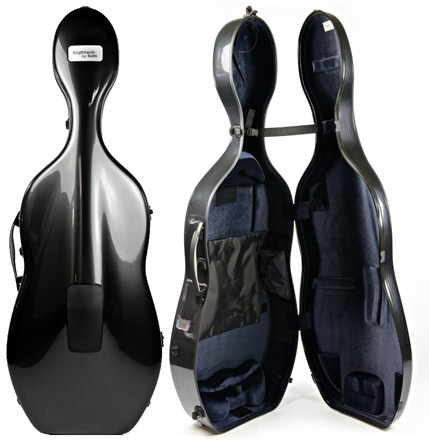 Accommodates 4/4 Cellos with body length up to 49 inches and lower bout up to 17 7/8 inches. New Tech is made in Black, Mint, Terracotta and Ultramarine. Voyager is Black only and does not have a glossy gel-coat. Color selection is made in the shopping cart. Latest model, with a new, contemporary style. 2 bow holders. 3.3 kg. Upper bout up to 38.5 cm. Lower bout up to 50 cm. Available in White, Aluminum and Black colors. This was the first of the High Tech series cases. 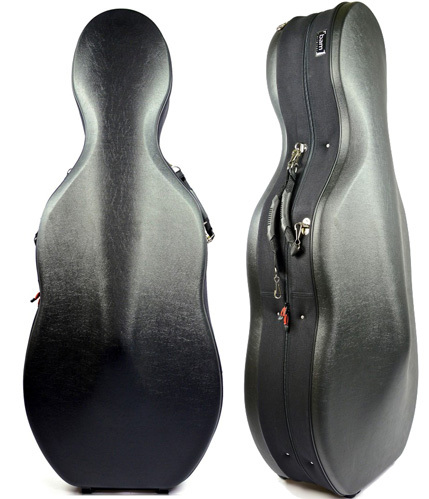 It is a larger sized case, and can accommodate large pattern Cellos, like those of the Montagnana model. 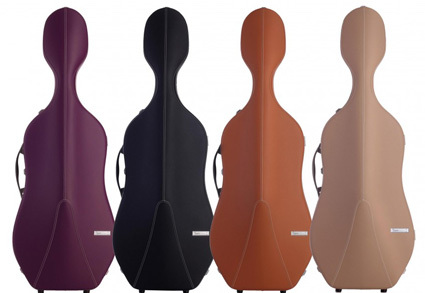 The adjustable padding system allows for a wide range of shapes and sizes of Cello to fit well. 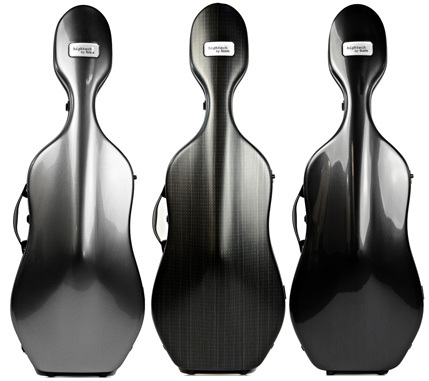 Fits 4/4 Cellos up to 52 inches in body length and lower bout up to 18 3/4. 2 Bow Holders. Sheet music pocket inside. 5 latches. Weighs only 9.7 pounds (4.4 kg). Made in Silver, Black Carbon. Color selection is made in the shopping cart. Just like the other 2.9 model, but with a new anti-scratch textured surface. The lightest case made by Bam. 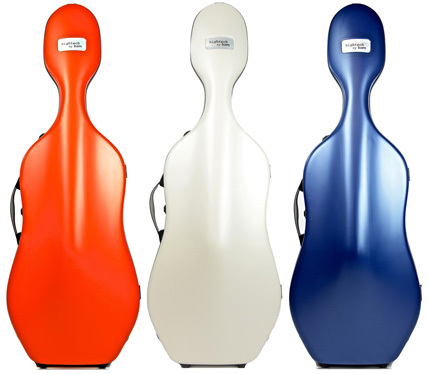 It's a great value, if you compare prices of other brands of ultra-light cello cases. 6.4 pounds (2.9 kg). 2 Bow holders. 5 Latches. 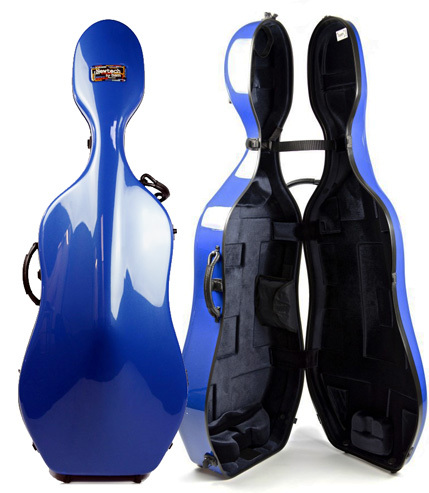 Accommodates 4/4 Cellos with body length up to 49 inches and lower bout up to 17 1/2. Made in White, Orangey and Navy Blue. Color selection is made in the shopping cart. 7.7 pounds (3.5 kg). 2 Bow holders. 5 Latches. 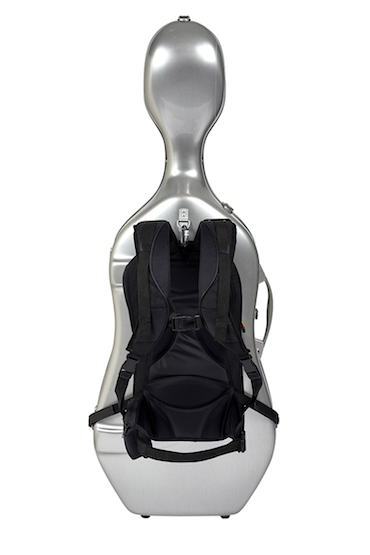 Accommodates 4/4 Cellos with body length up to 49 inches and lower bout up to 17 7/8. Made in Black Carbon, Tweed, Black Lazure, Silver Carbon. Color selection is made in the shopping cart. New look, with same features as the High Tech 2.9 series cases. Newer version of the L'Opera model, featuring a softer texture shell for a subtle look. 3.9 kg. This is a High Tech series case with wheels. Other High Tech cases do not have wheels. The name comes from the shape of the scroll area of the case. Available with or without wheels in choice of Anise, Azure, Black Textured, White and Orangey. These colors are for the lid of the case. The back portion of the shell is black. 9.7 pounds (4.4 kg) without wheels. 10.3 pounds (4.7 kg) with wheels. This is a new version of the ultralight Slim model case. It has a leather and aluminum appointed exterior. Available in Violet, Greige, Cognac, Chocolate, Sky Blue and Black. Color selection is made in the shopping cart. Available in 2013. 6.4 pounds (2.9 kg). 2 Bow holders. 5 Latches. 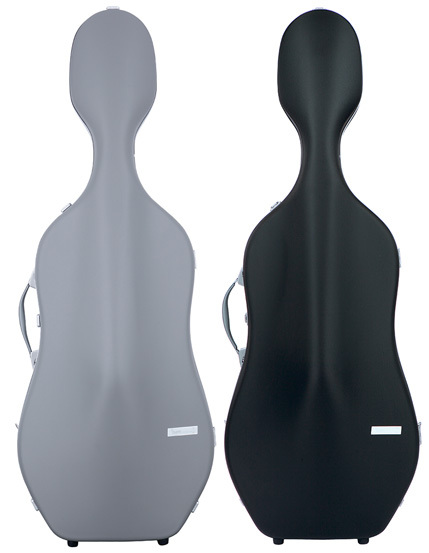 Accommodates 4/4 Cellos with body length up to 49 inches and lower bout up to 17 1/2. High Tech Slim 2.9 "La Defense"
Same as the 2.9 Slim model, but with the Brushed Aluminum "La Defense" look. High Tech Slim 2.9 "Paris"
Same as the 2.9 Slim model, but with the new, limited edition "Paris" look. ABS plastic shell. 8 latches. 2 bow holders. Made with or without wheels. With wheels Classic weighs 12.6 pounds (5.7 kg). Without Wheels it weighs 11.9 pounds (5.4 kg). 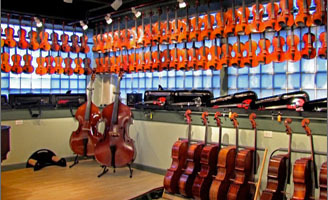 Accommodates 4/4 Cellos up to 49 inches body length and lower bout up to 17 1/2 inches. Made in Black, Peony Red, or Silver Gray. Color selection is made in the shopping cart. Emerald Blue has been discontinued. 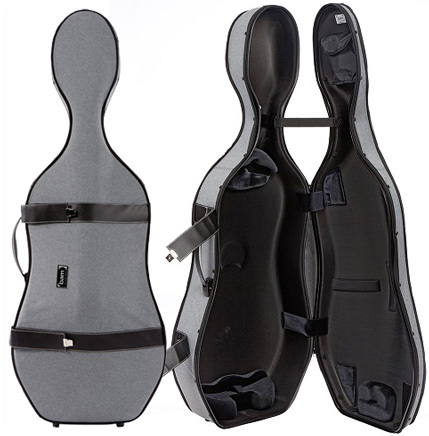 For all Bam Cello cases, this backpack is comfortable, and has storage for music and other accessories. 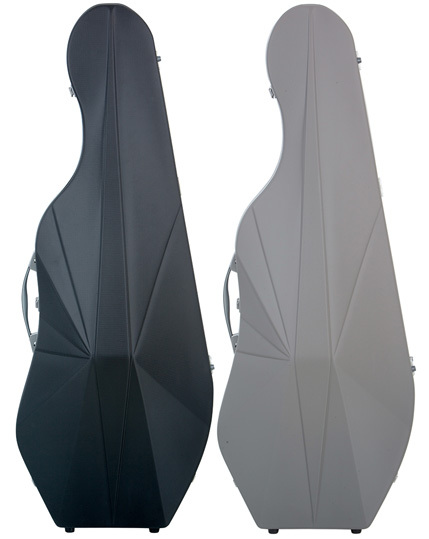 Dense foam and super tough ABS outer layer designed to add protection for air travel with your Cello. Black. Heavy Duty zippers, backpack straps and wheels. 20 pounds (9.1 kg). This product has been used with some cases made by other manufacturers. 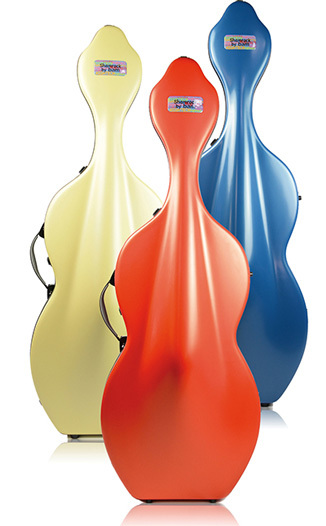 Colorful colors for Bam Cello cases.